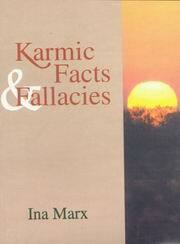 Karmic Facts and Fallacies demystifies such topics as karma, reincarnation, faith-healing, Yoga and meditation, and motivates the seeker, the skeptic and the stoic alike to integrate esoteric practices into their lives. This book provides inspiration and insight for both the dedicated New Age seeker, and for the average person who may be bewildered by New Age lingo and puzzled by its ideas. While metaphysical practices and techniques are accepted as part of everyday life by many, such ideas are still suppressed, ridiculed and misrepresented by the general media as esoteric flim-flam. But, like it or not, we are besieged by such way-out (and to some, downright spooky-sounding) topics as celestial prophecies, near-death experiences, encounters with angels and extraterrestrials, UFO abductions, and much more. These phenomena are exploited in literature, TV, film and plays, and are sensationalized by the news media. The popularity of these subjects proves that both believers and disbelievers continue to be curious. The Ina, from South Africa, seems to share much interest in ..